We only operated one dedicated Whale Watch Cruise on Monday…our Mid-Morning Whale Watch, and we were excited to see some wild cetaceans during this cruise. A fairly large pod of Spinner Dolphins found us on Alala, and apparently decided that we were worth investigating. This pod surrounded us for quite awhile, jumping, spinning, leaping, and riding our wakes. We love watching these animals, and we do our best to protect their precious resting time (Spinner Dolphins feed out in deep waters at night and come in shallow during the daytime to rest) — we maintain course and slow down when the pod veers over to see us. Unfortunately, the Humpbacks were hiding during the cruise, so we called it a “Fluke” and invited everyone on board to return again on another Whale Watch Cruise with us for FREE! But just because we didn’t see any whales during our Whale Watch Cruise doesn’t mean there aren’t Humpbacks around the island. Guests aboard our Snorkel and Whale Watch Adventure Cruise were completely surprised when, on the way to our Snorkel site to the south of the bay, a Humpback surfaced just about 75 yards off of our starboard bow and spouted. Of course we stopped the boat immediately, and we all got to see this whale spout 2 more times before he sounded. Ocean Sports Whale Fact of the Day: Humpback Whales and Spinner Dolphins are actually related — they’re both classified under the scientific order “Cetacean” (derived from the Greek word, “ketos” which translates to “Monster”).. But they’re in different sub-orders. Humpbacks are baleen whales, classified in the sub-order called “Mysticete”. 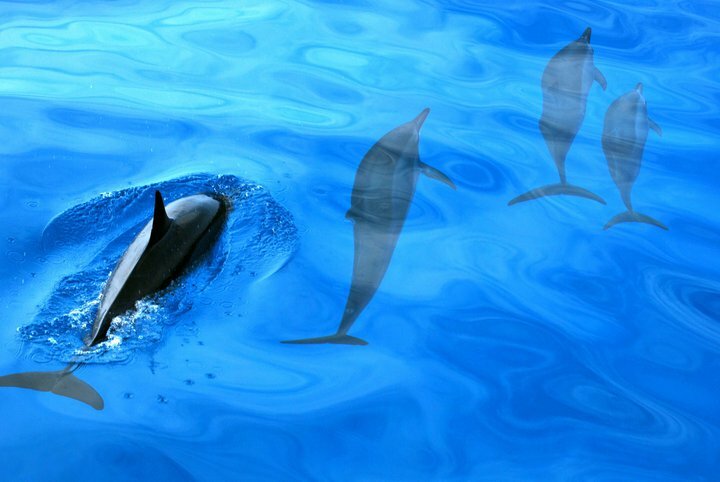 Spinner Dolphins are toothed whales, classified in the sub-order “Odontocete. For those of you etymologists out there, “Mysticete” either translates from the Greek “mystacoceti” meaning “mustached”, which is a pretty accurate description of how the baleen in these whales’ mouths appears…or is a “mis-translation” from the Latin “Mustiketos” which means “Mouse Whale” — perhaps one of the earliest examples of a scientist (in this case, Aristotle) demonstrating he understood the concept of irony. “Odontocete” shares a common root word with “orthodontist”…and means just what it sounds like — “toothed – whale”. ← First Whale Report of the Season!